This video was taken by the WSB-TV news team on January 9, 1961. The clip shows Charlayne Hunter and Hamilton Holmes arriving at the University of Georgia. This was the same day that U.S. District Judge Bootle ruled that the University of Georgia had used race as the determinant factor in excluding Hamilton and Hunter from admission to the University. Hunter and Holmes attended classes for the first time two days later on January 11, 1961. What do you think the atmosphere was like at the University when Hunter and Holmes first went to classes? How did Holmes and Hunter pave the way for future African American students to attend public universities in Georgia? 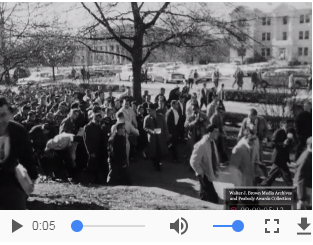 WSB-TV newsfilm clip of African-American students arriving on campus as well as the reaction of white students at the University of Georgia in Athens, Georgia, January 9, 1961 , WSB-TV newsfilm collection, reel 0779, 45:20/47:10, Walter J. Brown Media Archives and Peabody Awards Collection, The University of Georgia Libraries, Athens, Ga, as presented in the Digital Library of Georgia. After being recruited by NAACP leader Jesse Hill to help fight the segregation of Georgia’s public universities, Hamilton Holmes and Charlayne Hunter applied for admission to the University of Georgia in the fall of 1959. 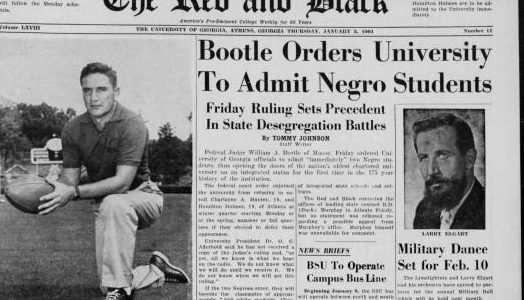 After Holmes and Hunter rejected for no reason many times, U.S. District Judge William Bootle ordered UGA to admit them in January of 1961. Yet, this does not mean these students were welcomed in Athens by any means. Governor Ernest Vandiver threatened to close the university rather than submit to integration. These newspaper articles are from UGA’s student newspaper, The Red and Black, which covered these events. What are the biases of the articles written and published in these sources? How can we get the facts from the sources if they are indeed biased? What is the purpose of bias primary sources in research?